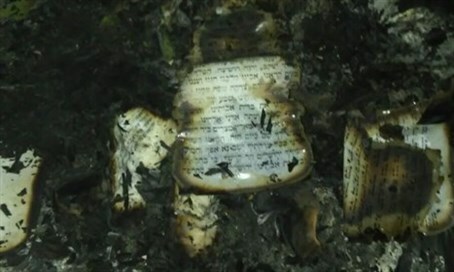 ADL condemns burning of Torah scrolls, desecration of synagogue in Gush Etzion. The Anti-Defamation League today condemned the Saturday arson attack against a synagogue in Givat Sorek, just outside the Israeli town of Karmei Tzur in Gush Etzion. Noting the synagogue’s proximity to the site of the 2014 murder of three kidnapped Israelis - and the fact that it was built in their name - the ADL expressed shock at the anti-Semitic nature of the attack. ADL CEO Jonathan Greenblatt described the arson as “a heinous hate crime” and called upon Arab religious and political leaders to condemn the attack. "The burning of the Torah scrolls at the Karmei Tzur outpost was nothing short of an act of anti-Semitism," Greenblatt said. "There is simply no political justification for such a heinous hate crime. "Throughout the millennia, anti-Semites have burnt Torah scrolls as a way of expressing hatred and contempt for the Jewish people, and it is greatly disturbing that similar incidents continue to occur today. We hope that the perpetrators are apprehended and prosecuted to the full extent of the law". "We call on Palestinian political and religious leaders to unequivocally condemn this terrible incident." The synagogue’s Torah scrolls were among the holy books burned in the attack.